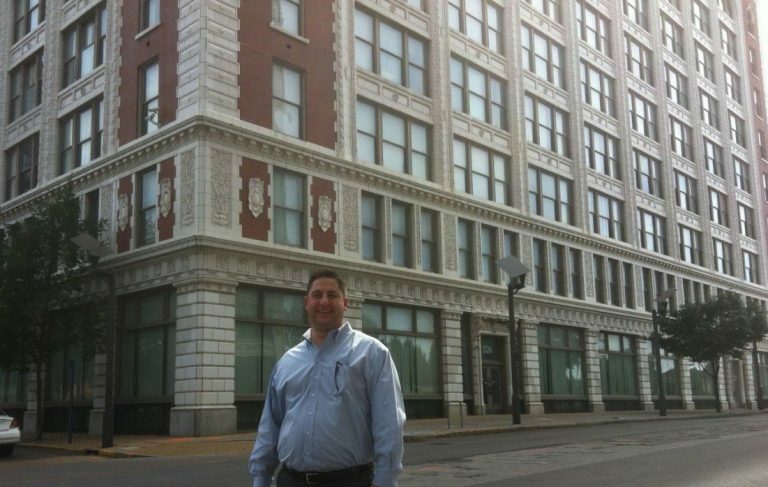 Where CPI Corp. processed portrait photos for Sears and others, developer Michael Knight is about to start building apartments in a historic downtown St. Louis building. The project will be known as the Monogram apartment project. Work is scheduled to begin in September to renovate the former CPI headquarters, at 1706 Washington Avenue, as 168 market-rate apartments and a preschool. "We're ready to roll," the developer, Michael Knight of Kansas City, said Thursday. Knight's name for the apartment project is Monogram in recognition of the building's original name. Spectrum Station, a for-profit preschool operator based in Kansas City, will occupy much of the nine-story Monogram's first floor. Resident parking and a dog park are planned for the parking lot on the building's east side. A one-block section of 17th Street will be closed to accommodate the project. St. Louis aldermen recently approved the closure over the objection of some downtown residents. Paric Corp. is the general contractor for the $51 million Monogram project, which is scheduled for completion in September 2017. Knight said the Mongram will have a fitness room and a rooftop pool. Monthly apartment rents in the range of $900 to $1,300 will include a spot in the fenced parking lot, he said. PARIC, one of the largest privately held St. Louis-based companies, pairs their unique construction management approach and negotiated general construction techniques to take projects beyond expectation. Offering customers the opportunity to Experience. Excellence. in every phase of the build. Established in 1979, PARIC specializes in commercial and interiors, education, healthcare, historic and urban redevelopment, hospitality and entertainment, municipal, science and technology, senior living, and sports complexes. For more information about PARIC visit www.facebook.com/ParicCorporation, or follow them on Twitter at @ParicCorp. To read more about the Monogram Apartment project check out the full article at Stltoday.com.